Puede seleccionar como máximo 1 viajeros en total. Fancy yourself as the next Maradona? 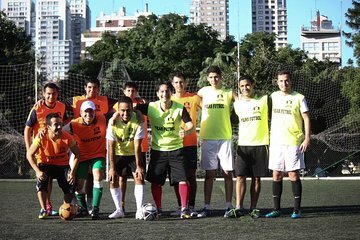 Put your football skills to the test and meet like-minded locals and tourists at a fun pick-up soccer game in Buenos Aires. Everyone is welcome, from beginners to seasoned players, and it’s a great way to experience the thrill of an Argentine 'futbol' match. Games are held each Thursday at 11pm, Friday at 7pm, Saturday at 5pm and 6 pm and Sunday at 8pm and 9pm, at the Parque las Heras in Palermo.